The U.S. Department of Homeland Security, Federal Emergency Management Agency (FEMA) hereby gives notice to the public of its intent to reimburse state and local Nebraska governments and agencies, and eligible private nonprofit organizations for eligible costs incurred to repair and/or replace facilities damaged by severe storms, tornadoes, straight-line winds, and flooding during the period of April 13 to 18, 2018. This notice applies to the Public Assistance (PA) and Hazard Mitigation Grant (HMGP) programs implemented under the authority of the Robert T. Stafford Disaster Relief and Emergency Assistance Act, 42 USC §§ 5121-5207, as amended. 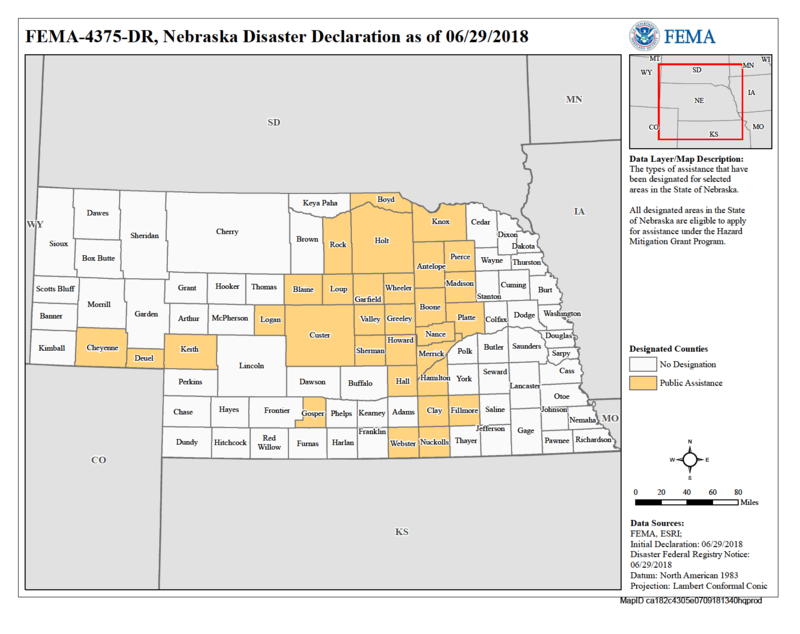 Under a major disaster declaration (DR-4375-NE) signed by the President on June 29, 2018, the following counties in the state of Nebraska have been designated adversely affected by the disaster and are eligible for Public Assistance: Antelope, Blaine, Boone, Boyd, Cheyenne, Clay, Custer, Deuel, Fillmore, Garfield, Gosper, Greeley, Hall, Hamilton, Holt, Howard, Keith, Knox, Logan, Loup, Madison, Merrick, Nance, Nuckolls, Pierce, Platte, Rock, Sherman, Valley, Webster, and Wheeler Counties. All counties in the state of Nebraska are eligible for HMGP. There are no counties designated for Individual Assistance. This public notice concerns public assistance activities that may affect historic properties, activities that are located in, or affect, wetland areas or the 100-year floodplain (areas determined to have a one-percent probability of flooding in any given year), and critical actions within the 500-year floodplain. Such activities may adversely affect the historic property, floodplain or wetland, or may result in continuing vulnerability to flood damage. 8. Repair/replacement of eligible private, nonprofit facilities (hospitals, educational centers, emergency and custodial care services, etc.). 4. The facility is not defined as critical (e.g., hospital, generating plant, contains dangerous materials, emergency operation center, etc.). FEMA will provide assistance to restore the facilities described above to their pre-disaster condition except when measures to mitigate the effects of future flooding may be incorporated into the restoration work. For example, insufficient waterway openings under culverts and bridges may cause water backup to wash out the structures. The water backup could wash out the facility and could damage other facilities in the area. Increasing the size of the waterway opening would mitigate, or lessen, the potential for this damage. Additional examples of mitigation measures include providing erosion protection at bridge abutments or levees, and extending entrance tubes on sewage lift stations. Disaster assistance projects to restore facilities, which do not meet the criteria listed above, must undergo a detailed review. The review will include a study to determine if the facility can be moved out of the floodplain. The public is invited to participate in the review. The public may identify alternatives for restoring the facility and may participate in analyzing the impact of the alternatives on the facility and the floodplain. An address and phone number for obtaining information about specific assistance projects is provided at the end of this Notice. The final determination regarding the restoration of these facilities in a floodplain will be announced in future Public Notices. 4. Emergency action is needed to address a threat to public health and safety. The effects of not relocating the facilities will be examined. In each case, the examination must show an overriding public need for the facility at its original location that clearly outweighs the requirements in the Executive Order to relocate the facility out of the floodplain. FEMA also will consult state and local officials to make certain that no actions taken will violate either state or local floodplain protection standards. The restoration of these facilities may also incorporate certain measures designed to mitigate the effects of future flooding. This will be the only Notice to the public concerning these facilities. FEMA also intends to provide Hazard Mitigation Grant Program (HMGP) funding under Section 404 of the Stafford Act to the state of Nebraska for the purposes of mitigating future disaster damages. Hazard mitigation projects may involve the construction of a new facility (e.g., retention pond, or debris dam), modification of an existing undamaged facility (e.g., improving waterway openings of bridges or culverts), and the relocation of facilities out of the floodplain. Subsequent Notices will provide more specific information as project proposals are developed. Information about assistance projects may be obtained by submitting a written request to the Regional Director, DHS-FEMA Region VII; 11224 Holmes Road; Kansas City, MO 64131. The information may also be obtained by calling: (816) 283-7060, between the hours of 8 a.m. and 4:30 p.m. Central Time, Monday through Friday. Comments should be sent in writing to the Regional Director, at the above address, within 15 days of the date of publication of this Notice.